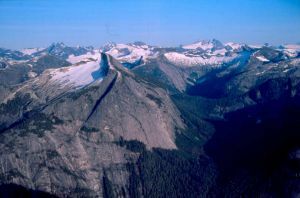 A massive isolated granite summit in the Powell River headwaters boasting huge expanses of bare granite slabs on all sides. Marked as 6245 feet on old 1:50,000. Name Notes: The three word name "John Clark's Castle" has been used by some locals for this peak. To make it an offical name, one cannot have an apostrophe, and is only 2 words.